Tons of people turned out this past weekend for what is always one of the West Coast’s most lively Pride celebrations. It was L.A. Pride weekend, and for the first time in decades, the festivities reached outside of the city’s West Hollywood bubble. 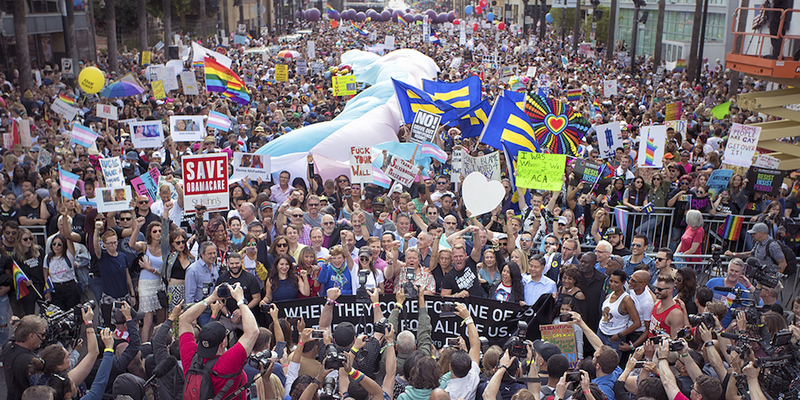 While the Pride Festival — featuring exhibitors, food and multiple stages with rotating live concerts — took place inside West Hollywood Park, the parade that annually traverses Santa Monica Boulevard was this year transformed into the very first #ResistMarch. Beginning in Hollywood (the neighborhood where, it should be noted, the first-ever Pride event took place in 1970), the march featured a ton of guest speakers (among them RuPaul, Maxine Waters and Cheyenne Jackson, who kicked off the march with the National Anthem) and ended in the WeHo city limits. The festival itself brought out over 62,000 people during its two days. Among the weekend’s wealth of musical talent were Chromeo, Brandy, Young M.A, Aaron Carter, and Erika Jayne on the main stage, along with Latin artists Graciela Beltran, Carmen Jara and a Selena tribute band, plus hip-hop artists like Jay Will, DJ Bad and Sevyn Streeter. The festivities were hosted by trans YouTube sensation Gigi Gorgeous and local nightlife fixture Billy Francesca. Sunday morning’s #ResistMarch made history, bringing out over 100,000 people to the streets of Hollywood and West Hollywood. 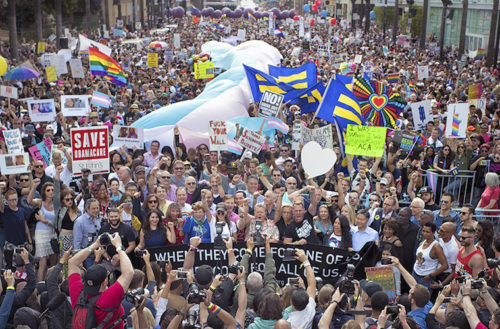 While the sentiment of the march was a mixture of celebration during Pride weekend and resistance to the current Trump administration, there were marchers for all causes present. (And a few Christian protesters, too, who were swiftly shut down by marching men and women.) You can view aerial footage of the march here. But don’t take our word for it that the weekend was a blast.